3 Bedroom End of Terrace House For Sale in Sandbach for Offers Over £450,000. Very well presented and finished to the highest standards, three bedroom end barn conversion located in a small and exclusive development of just eight barns set in the tranquil and rural area of Brereton. 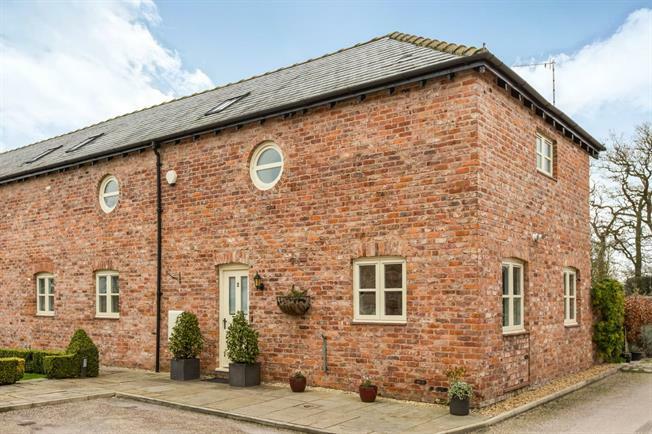 Ideally located for the surrounding market towns of Holmes Chapel, Sandbach and Congleton all offering a wide and diverse range of amenities and facilities. The property comprises of impressive lounge diner, kitchen with family area and WC. To the first floor there are three bedrooms with en-suite facilities to the master bedroom and separate family bathroom. Outside the property there is a good sized enclosed garden, allocated parking spaces and separate Garage. Viewing simply a must to appreciate this beautiful home and location.